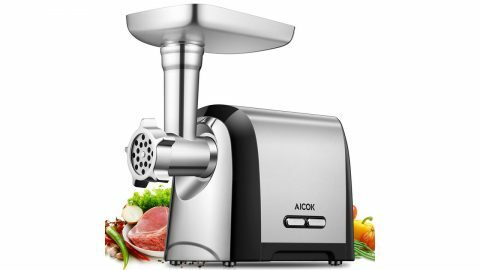 Save an extra 20% on AICOK Electric Meat Grinder, Stainless Steel Meat Mincer & Sausage Stuffer, 1200W Max, Concealed Accessory Box, 3 Grinding Plates, Kubbe & Sausage Kit Included, Kitchenaid & Commercial Use with this coupon code. This coupon code valid through April 1, 2019 or while supplies last on Amazon. Discount applies at checkout. 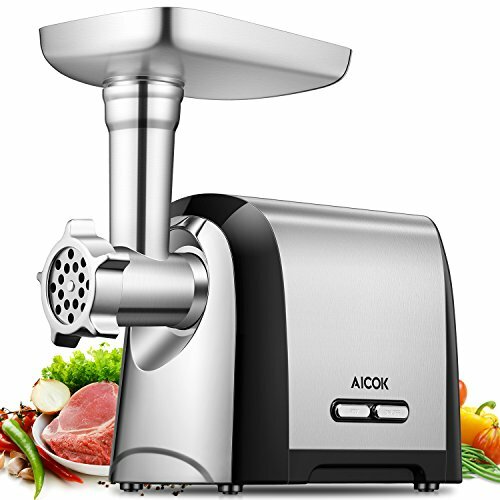 ★ 【 Fast & Efficient Meat Grinding 】This electric meat grinder engine with power up to 350W ( 1200W Max ). 2 pounds of minced meat can be produced per minute, an ideal choice as a meat processor (deer meat, chicken, pork etc.). Great meat grinder and Sausage stuffer maker. Must be your good helper to prepare delicious meals. ★ 【 Multiple Accessories Meet Different Needs 】The accessory box specially designed to use for the storage of accessories. Come with 3 grinding plates(diameter of the apertures: 2mm, 5mm, and 7mm) for a variety of fine, Medium, and coarse cuts, 2 stainless blades, 1 food pusher, set of 3 kubbe and sausage attachments. You can make the mouth-watering burgers, meatballs, meatloaf, sausages, and other meat blends at ease with the multi-attachment. ★ 【 Easy Usage 】 Only one touch, press the "ON/OFF" button and this food processing machine starts to mince food. The easy operation offers you with meat stuffing and minced vegetables. You could make meat paste, hamburger patties, meatballs, sausage, kubbe and so on. ★ 【 Easy to Clean 】Features a reversal setting ("REV" button) for easy unclogging residue. Amazingly convenient to assemble or dismantle and easy to clean after using. Soak all parts (except body) in warm soapy water and Wash them with the brush. ☆ Please apply neutral detergent when cleaning. ☆ Can't wash in the dishwasher. ★ 【 Two Years Warranty 】- ETL approved, safe and secure. This product includes 2 years replace guarantee! Stainless steel cutting knife and shell for extended service life. Made of food-grade material, the part that touches with the food can prevent the pollution of ingredients. You can contact our customer service if there is any suggestion.